Make Roasted Garlic Twice-Baked Potatoes and get a guaranteed win. 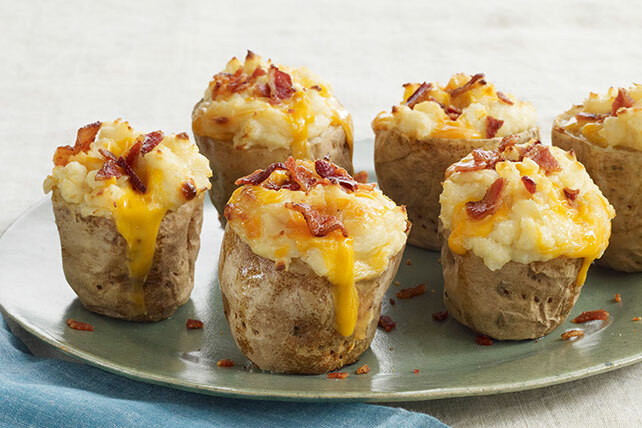 This recipe features fresh roasted garlic swirled into baked potatoes with VELVEETA and Parmesan and is topped with crumbled bacon. Delight your family with Roasted Garlic Twice-Baked Potatoes tonight. Cut thin slice off top of garlic; discard top. Place garlic on sheet of Reynolds Wrap® Aluminum Foil; drizzle with oil. Wrap loosely with foil. Prick potatoes in several places with fork. Bake potatoes and garlic 1 hour. Reduce oven temperature to 350ºF. Cut small slice off both ends of each potato. Cut potatoes crosswise in half. Scoop out centers, leaving 1/8-inch-thick shells. Place potato flesh in medium bowl; mash. Squeeze garlic out of papery shell into bowl with potatoes. Add sour cream, 3/4 of the VELVEETA and Parmesan; beat until fluffy. Spoon into shells, mounding filling as necessary; place in shallow baking dish. Bake 30 min. ; top with remaining VELVEETA. Bake 5 min. or until melted. Sprinkle with bacon. Save 40 calories and 5g fat, including 3g saturated fat, per serving by preparing with 2% Milk VELVEETA and BREAKSTONE'S Reduced Fat or KNUDSEN Light Sour Cream. Stuff potato shells as directed, but do not top with remaining VELVEETA. Refrigerate up to 24 hours. Heat oven to 325ºF. Bake, uncovered, 45 min. ; top with remaining VELVEETA. Bake 5 min. or until VELVEETA is melted. Sprinkle with bacon. Substitute 4 slices OSCAR MAYER Fully Cooked Bacon, chopped, for the cooked and crumbled OSCAR MAYER Bacon. Substitute 1-1/2 cups KRAFT Shredded Sharp Cheddar Cheese for the VELVEETA, stirring 1-1/4 cups of the Cheddar into the mashed potatoes along with the sour cream and Parmesan, and topping potatoes with the remaining 1/4 cup Cheddar the last 5 min. of the bake time.